"In Israel, everybody has a story." For the last eight years, Roger and Vee have made a series of long-haul trips which have included a number of Islamic countries: Morocco, Egypt, Jordan, Turkey and Uzbekistan. All these holidays were taken with specialist companies like Voyages Jules Verne and Kuoni. They had long wanted to visit Israel but felt that this was such a different country that they wanted to see it in a different way. Since they are political rather than religious, they were keen to meet people as much as to see places. So they were delighted when the chance came to visit Israel with a good Jewish friend who knows the country intimately and has many friends there. 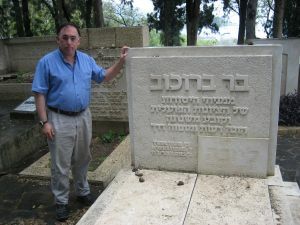 Eric Lee was born and brought up in the United States, but later moved to Israel where he spent 18 years living on kibbutz [for his blog click here]. Nine years ago, he moved to London with his wife Noemi and son Yonatan and, for eight of those years, Roger and Vee have been close friends of the family. 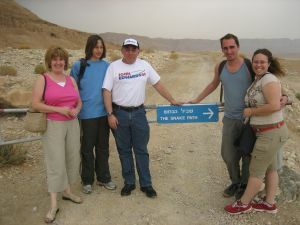 This trip to Israel then involved Roger and Vee accompanying Eric and Yonatan (now 14) on a visit to the country planned by Eric to ensure that we saw a variety of sights and met a good number of his Israeli friends. We were fortunate to talk to around 20 people, all of whom had a story which told us something about the country as well as them. In much abbreviated form, this travelogue tells some of those wonderful stories. 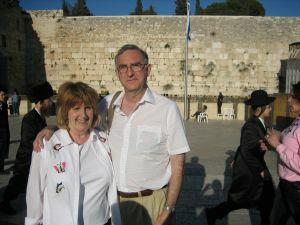 For Roger, Israel was his 46th country visited. He prepared for the trip by reading "The Middle East: 2000 Years Of History From The Rise Of Christianity To The Present Day" [for review click here] and, during the holiday, he read most of the book "The Palestine-Israeli Conflict" [for review click here]. 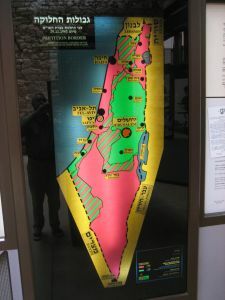 The state of Israel came into effect on 14 May 1948 as a result of a United Nations General Assembly resolution of 29 November 1947 that intended to partition the British mandate of Palestine into three entities: a Jewish state, an Arab state and international jurisdiction for the city of Jerusalem. Israel is bordered by Lebanon in the north, Syria and Jordan in the east, and Egypt in the south-west. Ever since its creation, the existence of Israel has been opposed by its Arab neighbours and by Palestinian groups. There were full-scale wars in 1948, 1956, 1967, 1973 and 1982. In addition, there were invasions of Lebanon in 1978 and 2006. Also the Palestinian Arabs of the Gaza Strip and West Bank have conducted two instances of intifada (the word means 'uprising'): one from 1987-1993 and another from 2000 to the present day. So, more than any other region of the world, there has been a semi-permanent state of conflict for the entire duration of the state (and many years before). The population of Israel is around 7.1 million of whom about 76% are Jewish and about 20% are Arab. Among Jews, 68% are Israeli-born, mostly second or third-generation Israelis, and the rest are foreign-born: 22% from Europe and the Americas, and 10% from Asia and Africa. Palestinians in the West Bank, including east Jerusalem, have lived under Israeli occupation since 1967. The settlements that Israel has built in the West Bank are home to around 400,000 people and are deemed to be illegal under international law. Of all the countries in the Middle East, it is easily the most economically developed and the only liberal democracy. It was Good Friday in the Christian calendar when Roger and Vee and Eric and Yonatan met each other at 6.50 am at Terminal 4 of London's Heathrow Airport. Each couple had somehow managed to pack just one suitcase to make travel easier. Although a reported 2.5 million people were leaving the UK for this Easter weekend, everything went smoothly for our British Airways flight. The Boeing 777 took off at 9.10 am and 4 hours 10 mins later we landed at Israel's Ben Gurion Airport (named after the country's first prime minister). 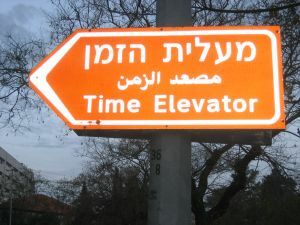 Since there is a two-hour time difference between the UK and Israel, it was 3.20 pm locally. We were met at the airport by Medad, Eric's 25 year old son from his first marriage, and Noga, Medad's 26 year old partner. Medad has done three years in the Israeli army as a physical education instructor and Noga has done her national service as a clerk in the air force. Both are now doing cinema studies at Sapir College [click here] located at Sderot, a town a mere one kilometre from the Gaza Strip. Since the beginning of the latest intifada, the town has been frequently bombed by Hamas and Islamic Jihad militants using ballistic rockets known as “Qassam rockets”. Medad and Noga already had a car and we had booked a rental car from Avis: a five-seater Chevrolet Vivant. It took visits to two locations and completion of two set of forms to obtain our car and therefore Eric introduced us to our first word of Hebrew balagan (which means 'mess' - for more on the word click here). Our driver was Vee since neither Roger nor Eric drive. Vee is a brilliant driver and she was great the whole trip but, even in the UK she has trouble with 'left' and 'right', and of course in Israel they drive on the opposite side of the road so, in the course of the week, we had a few rapid and exciting manoeuvres. We left the airport at 4.45 pm and drove south-east, past Latrun (site of a battle in 1948), and reached our hotel in Jerusalem by 5.50 pm. We had three nights at the Montefiore Hotel which was walking distance from the Old City. Now Jerusalem is one of the most religious cities on earth and we were arriving at one of the most religious times of the year, so we could not fail to be impacted in so many ways. First of all, we were in the annual period known as Passover or Pesach which celebrates the Exodus of the Israelites from Egypt (for more explanation click here). 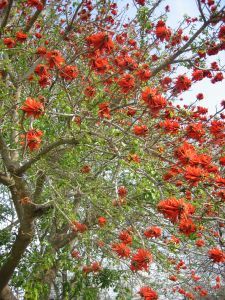 Next, we were minutes away from the start of the weekly shabbat which starts at the setting of the sun on Friday evening and equates to the Muslim Friday or the Christian Sunday (for more explanation click here). Observant Jews are prohibited from 39 principal forms of melachot (for the full list click here) - roughly translatable as 'work'- which includes pressing the button on a lift; therefore our hotel lift was programmed to stop automatically at every floor so that users did not need to press a button. As a result, of course, the lift took for ever. On the door frame of our hotel rooms, there was a mezuzah (the word literally means 'doorpost'). This refers to one of the 613 Commandments (honestly!) in Judaism which requires that a small parchment, inscribed with two sections from the Torah's Book of Deuteronomy, be affixed to each doorpost and gate in a Jewish home or business. At 6.20 pm, there was a siren announcing the commencement of shabbat so, when we went out at 6.45 pm, the city was astonishingly quiet. Most of the restaurants here obey the food restrictions of the kosher system whereby milk products and meat products are not served in the same premises (for more information click here) and of the Passover period whereby all bread is unleavened (this is known as matzo). 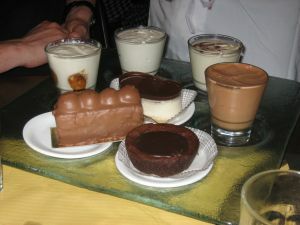 However, any restaurants open on a Friday night in Jerusalem would not be observing these restrictions and we chose to eat at a place called “Spaghattim” which served superb desserts. Some of us finished with cappuccino which in Israel is often called hafuch coffee (the word means 'upside down'). What all the restaurants – and many other public places – had in common was a security guard sitting on a stool outside, checking the bags of customers in case one is is a suicide bomber. These people risk their lives for a minimum wage and are often on the lowest rungs of the economic ladder, typically black Ethiopians. In the airport, we heard announcements reminding visitors that all guns were prohibited. In sensitive places like Jerusalem's Old City, there would be regular groups of armed soldiers. In the streets, one would see off-duty soldiers with an M-16 casually slung over their back. Whatever the quiet of a shabbat evening in Jerusalem, we were in no doubt that this is a nation in a semi-permanent state of war. It was Saturday morning in Jerusalem and we greeted each other with the words boker tov (Hebrew for 'good morning'). Breakfast was an unexciting affair since the menu was milk kosher items and matzo bread but salad is a favourite for an Israeli breakfast. We were going to spend the day away from the city and wanted to make an early start so, as soon as Medad and Noga arrived, we set off in two cars at 8.25 am. We were careful to leave Jerusalem avoiding ultra-orthodox areas, since there was a risk that we would be stoned because we were driving on shabbat. Once out of the city, much of our journey was through the occupied territory of the West Bank of the River Jordan. We headed south-east for the Dead Sea and, as we passed sea level, there was an Arab with a camel by the roadside hoping to make a few shekels from posing for a photograph. As we progressed through Judea, the terrain was one of bleached hills occasionally dotted by goats. We passed by the illegal town of Ma'ale Adumim [click here] and through both improvised and permanent army roadblocks. 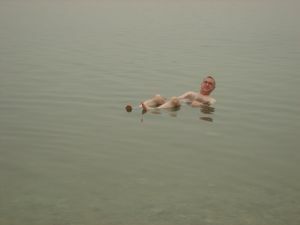 Once at the Dead Sea, we travelled south close by the shore until we reached our destination just before 10 am. 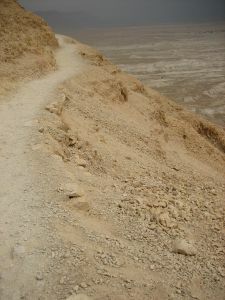 This was Masada [click here], the single most visited archaeological site in Israel. This hillside fortress was originally built for Jonathan the Macabee in 150 BC but fortified under Herod the Great in 43 BC. The site is primarily known as the location of the final act of the Jewish war against the Romans (the First Revolt) which began in 70 AD. Here just under 1,000 so-called Zealots held out against the Romans for three years and then, when defeat became inevitable, they carried out an elaborate mass suicide pact. According to an account by Flavius Josephus [click here], since Judaism strongly discourages suicide, the defenders drew lots and slayed each other in turn, down to the last man, who was be the only one to actually take his own life. A total of 936 died and two women and five children survived the suicide by hiding inside a cistern and subsequently told the Romans of the suicide pact. This heroic story has become mythic in its symbolism and today one sees signs proclaiming “Masada shall not fall again” (presumably Masada is here standing for modern day Israel). However, others have challenged the myth (for more information click here). There was a television mini series about the events at Masada made in 1981 [click here]. 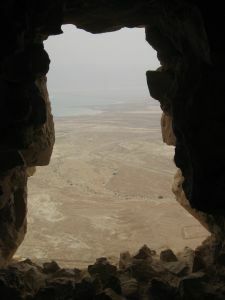 Whatever the truth about Masada, it remains a stunning location – a very high and totally isolated rock plateau surrounded by bleached, rocky terrain and overlooking the Dead Sea. On the eastern side of the plateau, there are two ways to the top: an easy way and a hard way. The easy way is to pay for a ticket for the cable car which takes a matter of minutes to make the ascent of 350 metres. The hard way is to walk up the Snake Path, a winding route of two metres in length with a total of 700 stone steps and occasional precipitous drops to one's right – an experience stated on a sign at the bottom to take around 45 minutes. You guessed it; we took the hard way – and it was tough. Even in conditions of warm but not overly hot weather, it is took the first of us to reach the top (Roger) 55 minutes and his pedometer registered 4,000 steps. Vee made it in another 10 minutes. 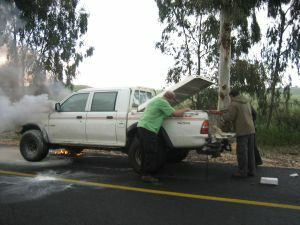 Then came Eric and Yonatan and – 80 minutes after we started – came Medad and Noga (who suffers from blood pressure). The top of the plateau is flat and rhomboid-shaped, about 1,800 feet (650 metres) long and by 900 feet (300 metres) wide, and 450 metres above the level of the Dead Sea. The Romans eventually concluded the siege by constructing a huge ramp path along the western site of the plateau and one can still observe that today. In fact, there is not a great deal to see of the buildings, since the destruction of the last two millennia has been considerable, and much of what one does see is reconstructed from original materials (a thick wavy black line indicates where the reconstruction starts). Also the view is a strange one: endless bleached white rock, as if one were on the moon, and the Dead Sea visibly receding as a result of ecological damage. But the majesty of the place and its importance in Jewish history are undeniable. After the exhausting climb to the plateau, we took the cable car down and, after cold drinks, left the site after three hours at 1.50 pm. We were meeting Noga's parents for lunch, an occasion of added significance since Medad and Noga recently became engaged and this was Eric's first meeting with the intended in-laws. The location was the nearby Crowne Plaza Hotel close to the town of Ein Boqeq by the Dead Sea. In fact, this proved to be a slightly surreal venue because the hotel had been taken over by observant Jewish families for the Passover holiday and the place was swarming with children playing board or card games since no 'work' is allowed (i.e no television or computer). Noga's father Paul is Danish and her mother Esther is Yemenite which is an interesting combination and they were accompanied by Paul's mother, another Esther, over from Denmark for a holiday. They are delightful people and it was a most congenial occasion. In spite of Eric stumbling onto all sorts of sensitive subjects, it seems that the marriage is still on (as soon as some complicated religious arrangements can be completed). The nine of us drove a little further to Ein Boqeq proper to experience a special floating experience. The Dead Sea [click here] is one of the natural wonders of the world with its own unique ecosystem and sauna-like micro-climate. At 295 metres below sea level, it is the lowest point on the surface of the planet and one of the hottest, so its water is the most saline on earth and its atmosphere the most oxygenated. Sadly the diversion of water for various purposes has reduced the level of the Dead Sea by some 22 metres and the fall continues. One consequence is that the sea is now divided by the Lisan Peninsula making the lower (smaller) section, where we were, even saltier. We all changed into swimming gear and headed for the water. In fact, entering the so-called sea – it is in fact a lake – is not a straightforward matter. If this was a sea, one would have a sandy approach but, since this is the saltiest body of water in the world, the lake floor comprises sharply uncomfortable salt rocks. Indeed Roger managed to lacerate the fingers of one hand and Yonatan cut his feet on these rocks and, in such salt water, that really stings. Once in the water, though, the experience is amazing. Swimming is effectively impossible owing to the salinity of the water and in any event it is not a good idea to splash because the salt in one's eyes or in one's mouth is a very unpleasant business. Instead one just lies back and floats with no effort whatsoever. Floating serenely with one's eyes closed is an immensely relaxing, almost mystical, experience unlike any other one has known. It was towards 7 pm when we called it a day, bid farewell to Noga's family, and set off back. Stopping briefly for a drink at the oasis of Ein Gedi [click here], we had no trouble reaching Jerusalem but a few problems navigating the city's road systems to return to our hotel for 9.30 pm. Although it was quite late, we still needed to eat some dinner and found a small place with the original name of “Coffee Shop” where the waitresses were more attractive than the food (a milk-based Passover menu). It was Easter Sunday in the Christian calendar and our hotel in Jerusalem was full of Christian pilgrims from Siberia, one of them a dead ringer for Rasputin with beard, ponytail and a huge gold cross around his neck. We were spending the day in Jerusalem [click here]. Historically it is deeply sacred to the three great monotheistic religions of the world: Judaism, Christianity and Islam. Prior to the creation of the state of Israel, the city served as the capital of the British mandate of Palestine. From 1949 until 1967, only West Jerusalem was considered part of the Israeli capital but, since then, the whole of Jerusalem has been under Israeli control. When there is eventually some sort of settlement of the Arab-Israeli conflict, control of and access to the holy sites of Jerusalem will be an extremely sensitive issue. Meanwhile, although it is the capital city of Israel and the seat of government, most foreign embassies are in Tel Aviv. It is the largest city in the country with a population of about 724,000. Leaving our hotel at 9 pm, we drove east and passed the Israeli Parliament which is called the Knesset: [click here]. Israel has a single-chamber Parliament of 120 seats elected by the purest form of proportional representation – a party list in which voters chose a party and not a candidate and parties obtain seats in close proportion to the votes that they receive. The threshold for representation is a mere 2% nationally – one of the lowest in the world. 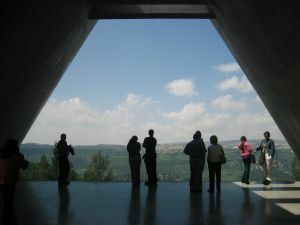 The Parliament building was closed on Sunday and so our first destination was the Mount Herzl Park [click here]. Literally round the corner from the Mount Herzl Park is the Yad Vashem Holocaust Historical Museum [click here] - our main destination of the morning where we were joined by Medad and Noga. The museum was originally opened in 1953 and the first proper exhibition in 1961 but a totally new main structure - designed by Moshe Safdie - was opened in 2005. This new museum is a prism-like triangular structure penetrating Mount Herzl with both ends dramatically cantilevering into open air. The route of the museum travels down a central path from which 'chapters' branch out on either side in separate rooms – 10 in all – which tell in chronological order the story of the Holocaust in all its horror. The visitor is guided through the 'chapters' by means of channels cut into the prism floor which block the progression of the route while maintaining an uninterrupted view between the two ends of the prism. As the story progresses, visitors descend deep into the mountain, ascending again towards the end. The Holocaust History Museum is the largest of its kind in the world and has more than 2,500 authentic artifacts and includes more than 90 personal accounts. We spent three hours there but one could easily spend a whole day. Roger and Vee have visited many Holocaust museums and memorials around the world, but this one is very special because of its location and size. Also it is a bold exposition which is not afraid to ask some tough questions such as: Why did the Allies not bomb the rail tracks leading to Auschwitz? Why did Pope Pius XII not protest publicly against the death of the Jews? One distinguishing feature of this particular museum is the emphasis on the resistance in the ghettos and the forests and the outbreak from the camp at Sobibór. The other distinguishing feature of this museum is how it is closely integrated into the narrative of the Jewish state itself. There are 'chapters' which set the scene before the Second World War, but also 'chapters' which deal with the post-war establishment of Israel and the exit bursts forth from the mountain's slope to a dramatic view of Jerusalem. The message is clear: this is where the Holocaust has led, to a Jewish state where Jews can be free of persecution. After the museum itself, one can visit the Hall of Remembrance where the stone floor is engraved with the names of 21 concentration camps and the Way of the Righteous which honours gentiles who helped the Jews such as Oscar Schindler. After this moving visit, we returned to the city centre for a late lunch at a restaurant chain called “El Gaucho” which served huge chunks of beef. Then we spent the late afternoon and early evening in the Old City [click here] which is a World Heritage site. The Old City takes its shape from the end of the 12th century and consists of four quarters: the Christan Quarter in the north-west, the Muslim Quarter in the north-east, the Armenian Quarter in the south-west and the Jewish Quarter in the south-east. This small area contains sites deeply holy to Jews, Christians and Muslims and yet none of the six of us have a religious faith so we were not so much awed as amazed by what we saw. There are seven gates and we entered through the Jaffa Gate and walked down a narrow cobbled street full of stalls marking the division between the Christian and Armenian Quarters. The stall keepers were Arab but were selling T-shirts with a wide political choice of slogans ranging from the pure tourist “Red Sea Dead Sea Med Sea”) to the outright pro-Israeli (“Don't worry America – Israel is behind you”). We had to go through a check point of armed soldiers and a metal detector to gain access to a wide plaza in front of the Western Wall (HaKotel HaMa'aravi in Hebrew or Wailing Wall to most foreigners). Physically this is impressive: it is 65 feet (20 metres) high and the largest stone is 45 feet long, 15 feet deep, 15 feet high, and weighs more than one million pounds. Religiously though it is even more special: Jews believe this to be the only surviving remnant of the Second Temple which was destroyed by the Romans in 70 CE (although the wall was never actually part of the temple but rather the retaining structure built to support the mount above). Above the wall to the left one can see the shining gold Dome of the Rock, the third holiest place in the world for Muslims (after Mecca and Medina). 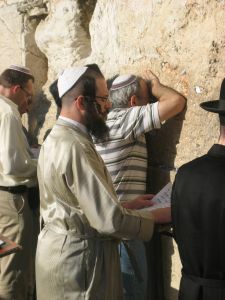 The Western Wall is the holiest spot in Jewish life and therefore it is constantly a place of devout prayer. The area in front of the Wall is divided by a fence - a mechitza - with a small area for women only on one side and a larger area for men on the other. The performances that go on here are utterly surreal to anyone who is not a strict Jew. The men wear bizarre clothing: wide-brimmed hats that seem too small for their head or huge fur circular hats, black suits or long black gowns, and under them a vest with trails. None of it seems to make sense, but apparently devout Jews wear the clothing worn by the rabbi who founded the particular group - probably 150 or so years ago and probably in an obscure part of Poland or Russia. 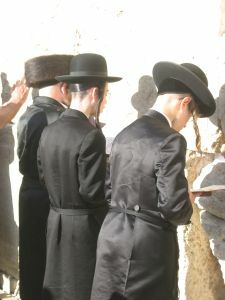 The praying is equally bizarre: constant recitation from the Torah and constant nodding to the Wall. Finally the Wall itself has little notes stuffed into every crevice carrying messages for God. One can only take so much of this strangeness and so we left the Western Wall and headed north to the Muslim Quarter to find the Via Dolorosa (or Way of Sorrow) – believed to be the route taken by Jesus Christ as he dragged his cross to Calvary and the location of the first nine Stations of the Cross. At the end of the route but just off the Via, there is the Church of the Holy Sepulchre [click here] believed to be built on the site of Calvary and the location of the remaining five Stations of the Cross. In the narrow winding streets, this building is not that easy to find, so Roger decided to ask a nun. We were lucky: she spoke English (although she was from Slovenia) and she was herself on the way to the church. The first attempt failed because the narrow lane was crammed with pilgrims, but our nun took us round another way and finally we entered the grey square which stands in front of the only entrance on the south side. Now, in its own way, the Church of the Holy Sepulchre is as bizarre as the Western Wall. Un-Christian as this may seem, control of the church and access to various parts of it are vigorously – and sometimes violently – contested by no less than six Christian denominations. Since 1767, the primary custodians have been the Greek Orthodox, the Armenian Apostolic and the Roman Catholic churches and then, in the 19th century, the Coptic Orthodox, the Ethiopian Orthodox and the Syriac Orthodox churches acquired lesser responsibilities. Think this narrative is exaggerating the degree of conflict between the churches? Well, on a hot summer day in 2002, the Coptic monk who is stationed on the roof to express Coptic claims to the Ethiopian territory there moved his chair from its agreed spot into the shade. This was interpreted as a hostile move by the Ethiopians, and eleven were hospitalized after the resulting fracas. In another incident in 2004 during Orthodox celebrations of the Exaltation of the Holy Cross, a door to the Franciscan chapel was left open. This was taken as a sign of disrespect by the Orthodox and a fistfight broke out and several people were arrested. And then there is the Miracle of the Holy Fire [click here] - virtually unknown in the West - conducted by the Greek Orthodox Patriarch of Jerusalem each Holy Saturday which caused such chaos and conflict the day before our visit to the church that it featured on the CNN news on our hotel television. You have never seen a church interior like it – so full of pushing and shoving pilgrims that it resembled a bazaar more than a place of worship. It starts immediately inside the main entrance where there is the Stone of Unction which Roman Catholics believe was the site of the anointment of Christ's body before its burial. Above the stone slab hang six lamps, one for each of the six denominations that contest use of the church. On the slab itself, pilgrims were rubbing oil and then rubbing their hands or face. 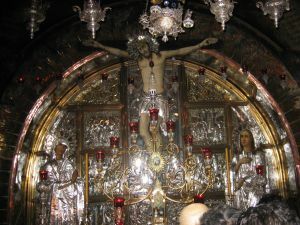 To the right of the Stone of Unction, up a steep flight of stairs, stand three altars, one of which Catholics believe represents the actual site of Christ's crucifixion. We needed to move away from the religious fanaticism of both the Western Wall and the Holy Sepulchre, so we left the Old City and looked for somewhere to have a light meal – but we were still not free of the zealots. We came cross a noisy gang of black-garbed ultra-orthodox Jews moving from one open shop to another screaming “Kodesh! Hodesh!” (“Holy! Holy!”) because they believed that to sell things on such a holy day broke one of the 613 Commandments. It was a relief to find a cafe called “Riff-Raff” on the pedestrianised Yoel Salomon Street where Roger tucked into maple syrup pancakes and Eric delighted in the use of free wireless Internet connection. 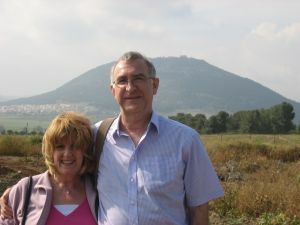 On our last morning in Jerusalem, we woke to the seventh and last day of Passover (for more information click here) which is so holy that the rules of shabbat apply and Roger and Vee were stuck in a so-called shabbat lift stopping at every floor. However, we were leaving Jerusalem to travel north, primarily to visit the kibbutz where Eric lived for 18 years. Leaving at 9.15 am on route 1, we passed the remnants of some of the military vehicles from the 1948 siege of Jerusalem. Then we moved onto highway 6 named after the former Prime Minister Yitzhak Rabin. At this point, we kept obtaining glimpses of “the wall” [click here]. Israelis call this “the separation fence” or “the security fence”, while most Palestinians call it “the racial segregation wall”. Whatever one calls it, this is a physical barrier being constructed by Israel mainly within the West Bank which consists of a network of fences with vehicle-barrier trenches surrounded by an on-average 60 metres-wide exclusion area and up to 8 metre high concrete walls. As on various points in our trip, views varied in the group. 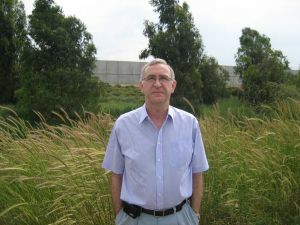 Eric – like most of Israelis - sees the wall as necessary and an effective aid to security and supports the idea of the wall if it sits on the "green line", as much of it does, but does not support the wall where it represents a land grab of Palestinian territory. Roger viewed the wall as unacceptable and illegal and a further barrier to a resolution of the conflict. Roger in front of a section of the "separation fence"
We turned off highway 6, on to 65 travelling east, and reached Eric's kibbutz at 11.30 am. Although there are still around 270 kibbutzim in Israel, only 120,000 now live on them – less than 2% of the general population. Furthermore, they have undergone profound change which many of the early members regard as a betrayal of the fundamental values of the movement. Eating arrangements used to be communal and free; now many take their meals in their homes and the canteens charge. All work used to be done by the kibbutz members themselves who were paid similar amounts regardless of role; now many activities have been outsourced and privatised and members are paid according to skills and experience as in the market economy. Homes used to be owned and allocated by the community; now – depending on tenure – they are being given or sold to the occupants. Perhaps most controversially, children used to be brought up and slept in children's houses; now the traditional nuclear family is the norm with children living with their parents. Eric's kibbutz at Ein Dor [click here] is located just south-east of Mount Tabor. It stands on the site of the Biblical Endor where King Saul went in disguise to consult a witch and persuade her to conjure up for him the spirit of of the dead prophet Samuel (which she apparently did, only for Samuel to announce Saul's defeat and death at the hands of the Philistines). A new kibbutz was established here in 1948. The word 'Ein' means springs and 'Dor' was a common name for cities. Originally there were three kibbutz movements and Ein Dor belongs to the movement called Hashomer Hatzair (The Youth Guard) [click here]. The kibbutz has a large wire factory ("TelDor"), agriculture, and a small but well organized museum on the ancient history of the area. Numbers have fallen recently and today around 300 families or 800 people live on the kibbutz (15 of them are - like Eric - American). 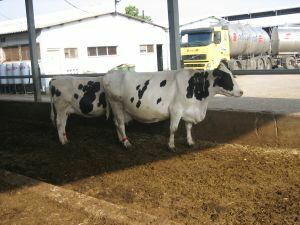 Eric lived at Ein Dor for 18 years, working in the factory on computers and in the farm milking the cows. He went there from New York with his first wife (also American) and they had their son Medad there. When the marriage broke up, Eric met his second wife (Belgian) on the kibbutz and they had their son Yonatan there. Medad really enjoyed being brought up in the children's house, but there are many stories of the children of the traditional kibbutz system finding this system lonely and even traumatising. We had only been at Ein Dor for five minutes when Eric first met someone that he knew – Avri on his bike was with Eric an early computer pioneer. We started at the home of Eric's first wife Shoshana who has now been on the kibbutz for 26 years. Like many members, she has a bomb shelter which she used during the first Gulf War when Saddam Hussein was regularly launching Scud missiles into Israel. Our first political discussion was with Eric's close (American) friends Mike and Shira. Mike is a large, bearded individual who served with the US Army in Vietnam where he was involved in combating the Tet offensive and had some “very scary” times. His time in Nam – together with that of other Americans who emigrated to Israel - was told by Eric in a book which he wrote entitled "Saigon To Jerusalem". We were told about all the changes on the kibbutz since Eric left: the privatisation of the canteen, the sale of the homes, the professionalisation of the management of the factory - and the arrival of a group of Buddhists (led by an Israeli-born convert). It was fun for Roger and Vee to watch Eric and Mike chatting vigorously about the old days and the old friends and Eric would repeatedly cry out: “Is he still alive?! ?” The bonds of friendship were palpable. Part of Eric's heart is still on the kibbutz. We moved on to the home of Eric's kibbutz 'mother'. Regina was born in Paris before the Second World War, she escaped to Vichy France during the war, and she came to Ein Dor in 1948. Now aged 79 and retired from her academic career as a theatre specialist and author of five books, this remarkable woman has an outstanding collection of videos and DVDs which reflect her passion for the cinema. We were joined by Medad and Noga – themselves students of cinema – for a 'light' lunch consisting of delicious homemade soup and a huge and immensely-rich homemade chocolate cake (Eric's favourite). Eric had not seen Regina for three years and to observe then sitting on the couch in animated discussion was genuinely moving. Next stop was another American couple: David was from Chicago and Rifka was from New York. Where Mike was loud and extrovert, David was quiet and mild – but equally welcoming and happy to talk about life on the kibbutz. He took us on a tour of the community. We passed an orange tree and Vee picked up an orange from the grass and ate it (we can't do that in London). We saw the factory and the dairy where Eric used to work and passed the museum where Jews and Arabs work together on inter-communal projects. Six hours after reaching the kibbutz, we left for dinner in a local Arab restaurant. Roger and Vee, Eric and Yonatan, and Medad and Noga were joined by Mike and Shira and lively discussions continued over a good meal which finished - for Roger anyway – with a delicious dessert called malabi (baklava and berries in rose infused cream). We left our friends from the kibbutz at 8.40 pm and drove on to our accommodation for the next two nights: a wonderful bed and breakfast place [click here] run by Erwin and Etha Frenkel in a town called Korazim [click here]. 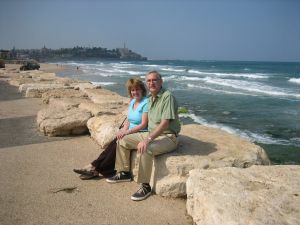 Like all Israelis, our hosts had their story: Irwin was born in Germany and left with his parents in 1937 to travel to the USA; Eta was brought up in Chicago; and the couple met while studying at the same university in Israel. Korazim is a small Jewish town which is mentioned in the New Testament and lies 2.5 miles (4 kms) north of the Sea of Galilee. Our rooms were huge and comfy and each was supplied with coffee and tea-making facilities, homemade biscuits, and a bowl of fruit. While Eric and Yonatan were in the ground-floor suite, Roger and Vee were housed in the rustic "beam" room (for picture click here). Tuesday dawned to find us at Korazim by the Sea of Galilee. The Frenkels provided a delicious breakfast including home-baked rolls and the much better coffee than our hotel in Jerusalem. We observed opposite the house a set of animals called hyraxes [click here] which Roger and Vee at least had only seen previously in South Africa. It looks like a cross between a cat and rat but apparently it is a relative of the elephant. Medad and Noga joined us and at 10.40 am the six of us set off in our two cars for the three-quarters of an hour journey to the Hula Valley Nature Reserve [click here]. 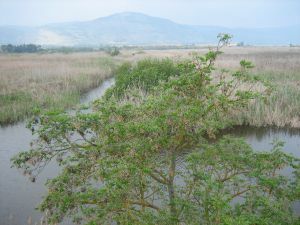 The reserve is located in the Great Rift Valley [click here] which stretches all the way from northern Syria down to central Mozambique and each year swarms of water fowl stop here on the annual migratory flight from Europe to Africa. The rest of the time it is home to up to 270 species of birds and a variety of other animals including water buffalo. We took the two kilometre walking trial and saw lots of tiny turtles, cat fish and ducks and one otter and one pelican – but no water fowl and no buffalo. However, we went indoors to view various tableaux and see a fun 3D film with various effects such as the seat rocking, the back moving, and puffs of wind and spray in one's face. The weather had been hazy when we reached the reserve and it was actually raining as we left after two and a half hours at 1.30 pm. 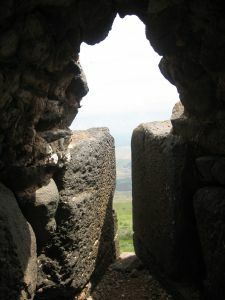 We drove further north up to the Golan Heights [click here]. This strategic location is technically part of Syria, but it was occupied by Israel in 1967 and annexed by them in 1981. We had heard some thunder; now we saw lightning; then it started to crash with heavy rain; next it shook with hail stones. What next, we wondered – a plague of locusts? No – but we did pass a car on fire spewing thick clouds. 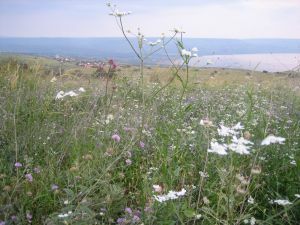 The Golan is a real contrast of images. On the one hand, the plateau is really green and majestic. On the other hand, there is a heavy military presence with rusting tanks from the wars with Syria, frequent road checks, and several Israeli army bases (including that of Medad – at Homa - when he was in the army). This is a strange part of the world and our venue for lunch was possibly even stranger. It was the Merom Golan kibbutz founded in 1967 where we ate at the so-called “Cowboy's Restaurant” opened in 1992. In a sense we felt as if we were at the end of the earth and yet eating at the same place at the same time was the mayor of Mexico City Marcelo Ebrard who governs a metropolis with a greater population than the state of Israel. 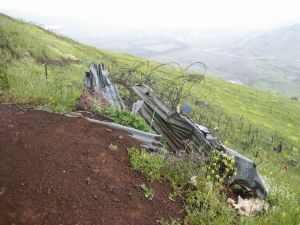 Suitably nourished, our group ploughed on further up the Golan to the top of Mount Ben Tal where, in crashing rain, we could see Syria beyond the Israeli tank blocks and other fortifications. At this stage, Medad and Noga left and the rest of us went on to a town called Katzrin [click here]. Eric described this as “a one horse town” but Roger thought that this overstated matters and preferred the term “one donkey town”. We stopped for refreshments at a small, dingy shopping centre in the middle of town and then called into a larger, much more modern, but equally deserted shopping centre on the edge of town. As we returned to our bed and breakfast place, the weather became much brighter and clearer and we had our first proper views of the Sea of Galilee [click here]. This freshwater lake is 200 metres below sea level and is famous as the location for the sea-walking thing of Jesus. 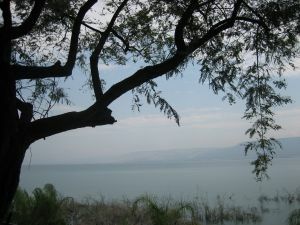 In fact, most Israelis do not call it the Sea of Galilee but the Kinneret (from the Hebrew word kinor which means 'harp' – a reference to the shape of the lake). The views were a total contrast to the Dead Sea where we were a couple of days before. Whereas the Dead Sea is dark, totally devoid of boats and surrounded by bleached and bare terrain, the Kinneret is beautifully blue, dotted with vessels and surrounded by green hills. We were back at our accommodation at 6.50 pm, but out again an hour or so later for a light dinner in the locality at a place called “Vered Hagalil” [click here]. Wednesday morning and at Korazim we had another wonderful Frenkels' breakfast – this time Erwin made us waffels. We talked with Erwin and Etha about the impact of the previous summer when Israeli forces took on Hezbollah in southern Lebanon. They told us: "It was a very ugly experience". Although they have a 'safe room', it was very noisy, they did not know the direction of the noise, and one rocket landed locally with several others in nearby Tiberias. They believe that Hezbollah is now being resupplied by Iran and that the next Israeli war will be with Syria. Before we departed, Vee bought homemade olive oil and marmalade and chatted with the Frankels' dog Murphy. Driving a little further south, we stopped for drinks at the Bet Gabriel arts centre. This a modern complex with wonderful views of the Sea of Galilee that in 1996 played host to talks between Shimon Peres of Israel, King Hussain of Jordan and Warren Christopher of the USA. 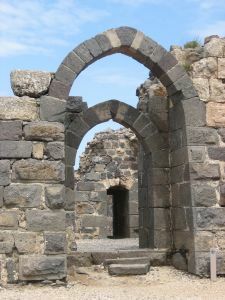 Leaving the Sea of Galilee behind, we progressed further south to visit the crusader castle of Belvoir [click here]. As the French name indicates, the castle commands stunning views: the Jezreel Valley to the west, the Jordan River and the mountains of Jordan to the east, and the Sea of Galilee to the north. It is set in the Kokhav HaYarden (Star of Jordan) Reserve, the name deriving from the poetic description of the castle by one of Saladin's commanders who tried to capture it from the Crusaders in 1182. Belvoir was built by the Knights Hospitallers in 1168 and, after a siege of one and a half years, in 1189 fell to 12,000 mounted archers led by Saladin. It was destroyed by the Muslims in 1220. After an hour at the castle, we struck out to the north-west to return to Eric's kibbutz of Ein Dor. 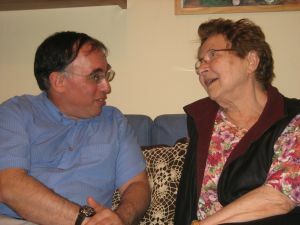 We started with coffee and a chat with Medad and Noga at the home of Medad's mother Shoshana. Discussion focused on one of Roger's favourite subjects: politics. It seems as if Israeli politicians are more prone than many to one sort of scandal or another: the Minister of Justice had to resign following allegations of sexual misconduct and subsequently he was found guilty of harassing a woman soldier at a ministry party; the Minister for Finance has been charged with embezzling up to ten million shekels from the National Workers Association; and the Prime Minister and Minister of Defence are anxiously awaiting the results of a commission of inquiry into their conduct of the 2006 invasion of Lebanon. As it started to crash with rain, we moved on to the home of one of Eric's closest friends on the kibbutz and his wife Irit. Uzi is a real character: a fast-talking bear of a man from New York's Bronx who spent two and a half years as a paratrooper in the Israeli army before serving in the reserves for another 20 years and still working as a volunteer on border duties. Along the way, he and Irit have had five children, not to mention owning a dog called Alonzo. They run two bed and breakfast places, each with a jacuzzi and wi-fi, and Irit provides Ayervedic massages (for more information click here). For Roger, it was an occasion for more politics and Uzi had a tough-minded perspective on things: "The existence of Israel is not for sure for all time ...The whole Arab world does not care for the Palestinians ...If Israel goes, the problems will not be solved". It was sunny again as we left Ein Dor after a two and a half hour stay (making a total of eight and half hours for our two visits to the kibbutz). We said farewell to Noga whom we would not be seeing again on this holiday, but arranged to see Medad later in Tel Aviv. 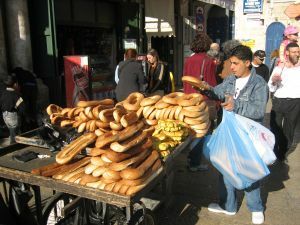 We headed south-west and soon stopped for a little something to eat in the city of Afula [click here]. We sat outside by a stall and ate falafel - spicy balls of ground chickpeas served with salad in pitta bread (for more information click here). The staff of the stall had a little trick whereby they would throw the balls in the air and catch them in a slice of pita bread or even simply with a pair of tongs. Pressing on south-west, we went through the town of Megiddo [click here]. Today Megiddo houses a top security Israeli prison, but it was a site of great importance in the ancient world, as it guarded the western branch of a narrow pass and an ancient trade route which connected the lands of Egypt and Assyria. According to some interpretations of the Christian Bible, this place will be the venue for Armageddon or the final battle between the forces of light led by Jesus Christ and the forces of darkness led by Satan or the Anti-Christ after the End of Days. Turning on to route 6, passing another section of the wall, and then taking route 5, we headed for Tel Aviv. Tel Aviv [click here] was originally the Jewish quarter of Jaffa, but now Jaffa is effectively a district of the much bigger Tel Aviv. It has a wonderful location by the Mediterranean Sea. The city was officially inaugurated in 1909 and today is a very cosmopolitan metropolis of 400,000 and the second largest in Israel. In 1948, it became the first capital of the new state of Israel, but the capital moved to Jerusalem in 1949. However, few countries recognise Jerusalem as the capital and therefore almost all the foreign embassies are in Tel Aviv. So is the Government's Ministry of Defence. It was 7 pm on Wednesday evening – just as the sun was setting over the sea – when we arrived in Tel Aviv and took up residence in the Dan Panorama Tel Aviv Hotel [click here] where our rooms gave great views of the surf rolling onto the beach just across the road. We were out in an hour looking for somewhere for a light dinner. 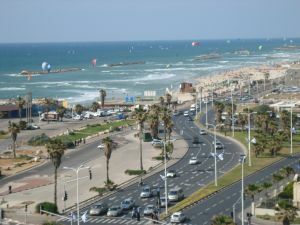 We strolled north along the promenade at Tel Aviv's shore front along Retsif Herbert Samuel. This is probably the most bombed street in Israel with several premises attacked by suicide bombers, sometimes more than once. The American Embassy backs on to the street and understandably has a formidable set of steel bollards in front of it. The worst atrocity took place at the Dolphinarium discotheque – just down the road from our hotel – on 1 June 2001. Twenty one Israelis were killed and 120 others were wounded when a suicide bomber blew himself up in a crowd of mostly teenagers waiting in line outside the disco. All but one of those killed were youngsters from the former Soviet Union and a memorial at the site carries their names in both Hebrew and Russian. When we were there, there were two handmade signs in Hebrew which caught contrasting reactions to the event: one proclaimed “We won't stop dancing” while the other insisted “God will take vengeance”. We ate at a place called “Yovata In Town” where both Roger and Vee had sesame-seed bagels with salmon and cream cheese. Thursday morning started with an excellent breakfast at the Dan Panorama Tel Aviv Hotel. There was a fabulous selection of breads, salads, cheeses and fruit (but no meat). This was to be what Eric called "our anti-British day" - although, to be fair, Roger was very keen to visits the museums that occasioned this description. 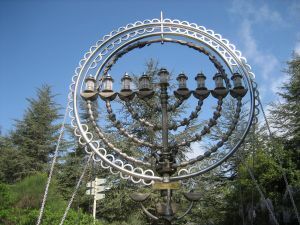 The Haganah – Formed in 1920, this was the main underground military organisation of the yishuv (the Jewish community in Palestine before the creation of Israel). It suspended operations during World War Two to side with the British against the Germans. However, after the war, it resumed operations such as the bombing of the country's railroad network and sabotage raids on radar installations and bases of the British police. It operated until 1948 when it became the Israeli army. For more information click here. The Irgun or, to use its full name, Irgun Zevai Leumi (ETZEL) – This operated from from 1931 to 1948 and it was a much smaller but more militant movement than the Haganah. Their most infamous acts were the bombing of the British military, police, and civil headquarters at the King David Hotel which killed 91 people and the kidnapping and execution by hanging of two British sergeants. Its last commander was Menahem Begin who eventually became Prime Minister of Israel from 1977-1983. For more information click here. The Stern gang or, to use the proper name, Lohamei Herut Israel (LEHI) – This was founded by Avraham Stern in June 1940, when Irgun decided to put on hold its underground military activities against the British during World War Two, and he separated from Irgun to form his own group. The LEHI was responsible for such acts as the assassination of the British ambassador Lord Moyne in Cairo, the assassination of the United Nations mediator Count Folke Bernadotte, and the massacre of over 100 Arab men, women and children at Deir Yassin. For more information click here. Just up the road from our hotel, along the sea front towards Jaffa, we came to the ETZEL Museum [click here] which commemorates the record of the Irgun movement. The museum was built by veterans of the Irgun and opened in 1983. It is clearly no coincidence that the creation of the museum happened under the Prime Ministership of the former Irgun commander Menahem Begin but, in many respects, it is remarkable that such a museum still exists because the language of some of the material is so bellicose. We started with a 20-minute film that one can view in Hebrew, Russian or English. 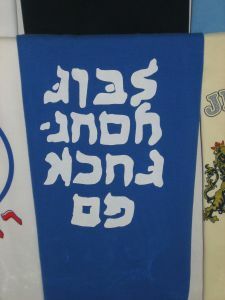 In English, this refers to those who died on Irgun operations against the British as “martyrs” and declares “May their memories be blessed”. 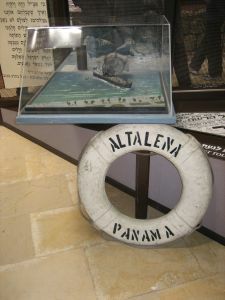 In the mythology of the Irgun, the most tragic day was 21 June 1948 when a ship called the "Altalena" attempted to bring arms into newly-proclaimed Israel and, since they insisted on a proportion of those weapons going to the Irgun instead of to the new Israeli army, the new Prime Minister Ben Gurion ordered his army to attack the ship, resulting in the deaths of 16 Irgun fighters (for more information click here). The musuem has a model tableau of the confrontation and an actual life belt from the ship. Now something remarkable happened. Eric had asked a young member of staff if she could explain some of the exhibits to his British friends and her efforts at English proved to be so faltering that she called out an old man from a back room to take over. He turned out to be a guy of 81 called Yosef Nachmias whose story stunned us. Of all the stories we heard on this trip to Israel, this was the most emotional and the most morally ambiguous. In 1940, he forged his birth certificate to join the British Army at the age of only fourteen and a half. He spent the next six and a half years in the British Army but, throughout this time, he was also a member of the Irgun. 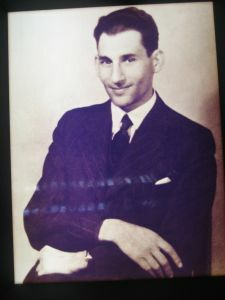 His English became so good that he was able to pass himself off as an British soldier and enter a British prison and organise the release of Irgun prisoners. However, he was later caught and court-martialled, sentenced as a traitor, and condemned to death by firing squad. As he put it to us: "Almighty God did not want us so soon". His sentence was commuted to 15 years imprisonment and he only served 13 months before being released. He resumed his Irgun activities and was wounded in the legs and neck. He was actually on the "Altalena" when it attempted to unload arms and his brother was a member of the Israeli army deployed to oppose the landing (but he refused to fire on the Irgun fighters). 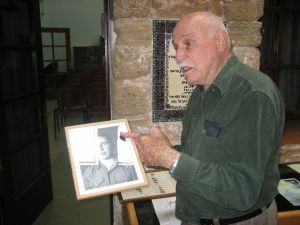 He showed us a television film made last year in which another Irgun member who was on the ship came to the museum and met him for the first time since 1948. This was a man was called Yulyo de Gabriel and he had spent his entire post-war years in Cuba and the USA, refusing until this point to visit Israel because of the attack on the ship by Israeli forces. The film showed the reunion of the men after an interval of 58 years and Yulyo thanking Yosef for saving his life when he was shot at and drowning in the sea as the ship came under attack. In the film, Yulyo was in tears and Yosef was in tears; in the museum, as the programme was shown, some of us were in tears. Life belt from the ill-fated "Altalena"
Yet, in spite of his quiet manner, Yosef is as politically hard-line now as he has always been. He told us: "My heart bleeds for the western part of Eretz Israel" - using language that denotes the idea that the state of Israel really ought to include the West Bank and even Jordan (for explanation click here). He confessed that: "I'm so scared that we do not have someone today like Menahem Begin". We had spent longer in the museum than we intended, but it had been an amazing experience. 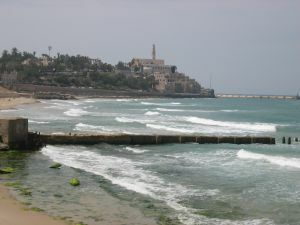 In bright sunshine, we walked on to the the ancient city of Jaffa [click here] which proudly proclaims its history of 4,000 years. It has been conquered 22 times in its long history but still stands. We strolled up to Old Jaffa and sat in the main square opposite St Peter's Church drinking orange juice made freshly from Jaffa oranges. Afterwards we made our way past the famous Jaffa clock tower [click here] and back into Tel Aviv to the fashionable Florentin district which dates back to the 1920s and has buildings in the International style. After a drink, we took on the next episode of British-bashing by visiting the LEHI Museum [click here]. 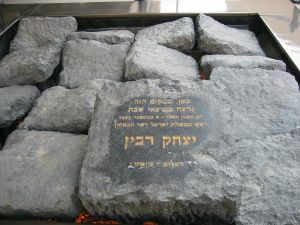 This is located in the actually building where British agents found and killed Avraham Stern, the Polish leader of LEHI, often called the Stern gang. In the very room where “Ya'ir” (Stern's code name) was murdered on 12 February 1942, we watched a slide show on the incident. The language was amazingly triumphalist. Once Stern was dead, we were told that “He marched at the front line of every battle until the British were expelled”. Exhibits cover events such as the assassination of the British ambassador Lord Moyne in Cairo and the assassination of the United Nations mediator Count Folke Bernadotte in Palestine. It seemed incredible that a museum could 'celebrate' such acts. For Roger, who has been professionally associated with Northern Ireland 'troubles', this is all seemed like an echo of the IRA or even – closer to home – Hamas and Hezbollah and he saw it as straightforward terrorism, but Eric explained that, for some Israelis even today, it is “complicated”. It was Thursday afternoon and we had spent several hours visiting two museums commemorating armed resistance to the British mandate. It was time for something more prosaic. 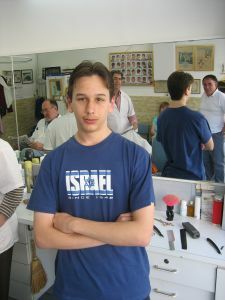 Our 14 year old Yonatan had not had a proper haircut for a year but had decided that now was the time to smarten up, so we found a Russian-speaking barber and he did a wonderful job transforming Yonatan. We had not eaten since breakfast so, at 4.20 pm, we stopped at a downtown café and ate falafel. Next stop was the nearby Shienkin Street, often regarded as Tel Aviv's trendiest street. It is a place to sit outside a café, have a drink, and people-watch – which we did most enjoyably. Our route back to the hotel was through the Shuq HaCarmel market. 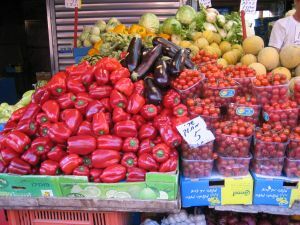 The babble of noise that greeted us came from Israel's largest, most colourful open-air market which sells just about everything. 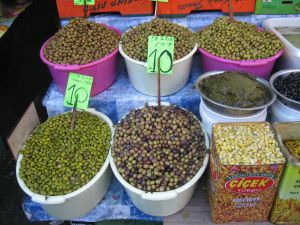 Along one long road, you can find almost anything imaginable, for the lowest prices in the city, from different kinds of bread and pastry to delicious olives, dried fruits and exotic spices. We were back at our hotel at 6.20 pm after being out on foot for over eight hours. There was time to rest and read before we met another friend of Eric's for dinner. Alex collected us from the hotel at 8.25 pm, took us for a stroll around the oldest district of Tel Aviv called Neve Tzedek [click here], and then on to an excellent restaurant called “Suzana” where we ate and chatted outside. Alex was brought up in Chicago and New York, he studied at Yale with Bill and Hillary Clinton, and he came to Israel in 1981. He is now one of the country's top labour lawyers. His wife Sarah – whom we only met very briefly at the end of the evening – is Argentinian and her grandfather was a Romanian Jew who was a censor with the Ottoman Empire. Alex likes to be provocative and Roger does not mind being provoked, so the two of them had a lively debate lasting most of the evening and focusing mainly on the nature of statehood. On Friday morning, we left the hotel at 10.20 am and took a cab to the Tel Aviv Museum of Art which is opposite the Israeli Ministry of Defence, an imposing building bristling with multiple antennae. Here we were rejoined by Medad. We viewed the collection of Impressionist and Post-impressionist paintings which includes works by Monet, Renoir, Pissaro, Sisley, Cézanne, Van Gogh and Gauguin. 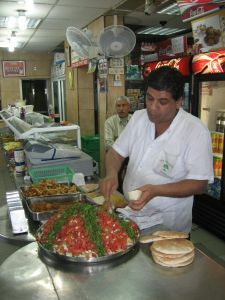 For lunch, we found a good place called “Lehem Erez” [click here] which has an adjoining bakery and restaurant. Our last visit of the day was to a rather shabby square originally called Kikar Malkhei Yisra'el (Kings of Israel Square) but now called Kikar Yitzhak Rabin [click here] as a result of the assassination of Prime Minister Rabin on 4 November 1995 when he had just finished addressing a peace rally in the square. Medad was one of the 150,000 supporters in the square at the rally. One of the others present that day was an Israeli Right-wing extremist called Yigal Amir who objected to the Oslo Peace Accords and shot Rabin as he was about to leave the area. There is a memorial, in the form of a section of pavement seeming to rise up in revolt at the murder, and other memorials on the nearby walls. At this stage, we returned to our hotel and rested up before our evening out. At 6.15 pm, we were out again and Vee drove Roger, Eric, Medad and Yonatan north to a very attractive town called Ra'anana [click here]. 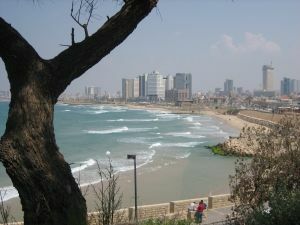 Ra'anana attracts many immigrants from English-speaking countries, including the USA, the UK, and South Africa, who migrate there because of the ease of communication. One of Eric's American cousins lives here with his family and another of Eric's American cousins and family who live in Jerusalem had come over the reunion. It was a truly memorable evening. Now it was shabbat [click here], the weekly day of rest in Judaism which is observed, from before sundown on Friday until after nightfall on Saturday, by many Jews but with varying degrees of strictness. In the case of the two families that were our hosts, observance is very traditional so that, although we arrived at the house at 7 pm, we did not see any of the men or boys until 8.40 pm because they were at the synagogue. Meanwhile the two wives and the older girls lit two candles - representing the two commandments: zakhor (remember) and shamor (observe) - covered their eyes and sang a song before the wives changed clothes and donned head scarves. When we all sat down for dinner at one long table, there were our Ra'anana hosts Ian and Faith and their six children, the Jerusalem relatives Drew and Ruth and their four sons, and we five visitors, making a noisy 19 in all. We started with the recitation by Ian, at the head of the table, of kiddush or "sanctification" over kosher wine and then all drank some of the wine. Next there was singing of zemirot, special songs for the Shabbat meal. Then Ian sprinkled salt and recited a prayer over two loaves of challah, a sweet, eggy bread shaped in a braid, before cutting the two loaves (lechem mishneh) and we each in turn went to wash our hands, take the bread and eat it and, during this, we were not permitted to speak. At this stage, we tucked into a plentiful array of food, all cooked before shabbat. At the end of the meal, we may have had sufficient food for the body, but there then followed food for the soul in the form of discussion of the possible meanings of a part of the Torah assigned for this particular week of the year. The whole evening was like a scene out of a Woody Allen movie. There was so much noise and movement, so much discussion and interruption, so much debate and arm-waving – and also so much community and love. Roger and Vee observed it all with wonder and joy, but said nothing until the end of the evening, when Roger felt emboldened to ask a few questions. What was it, he inquired, that all religious Jews believe? Well – discussion, debate, disagreement, no consensus. Well then, he continued, do all religious Jews believe in an afterlife? More discussion, more debate, no more agreement than previously. Finally, he ventured: when Jews talk of being 'the chosen people', what is meant by this? Well, the debate around this question was so wandering that it did not begin to address the issue. But they loved the questions and they loved the discussion. We could have talked all night, but we visitors had to drive back to Tel Aviv. Some of us went to the bathroom before leaving, taking good care that we did not switch off the light – because the switching of lights is 'work' which is forbidden on shabbat. All evening Roger was unable to write any notes or take any photographs because both these activities constitute 'work' as well. But we had had a wonderful evening and felt privileged that religious Jews had been so willing to share their observances with we secular visitors. Saturday was our last morning on holiday. Medad had stayed overnight with Eric and Yonatan, so there were still five of us when we set out for a last stroll in Tel Aviv. Since it was shabbat, most places were closed and it was very quiet. We walked to the area of Kikar Dizengoff, a square named after the city's first mayor which lies at the heart of one of the city's main shopping centres. It features the so-called 'fire and water' fountain designed by Yaacov Agam. Eric was keen to show us a nearby street named after Ludvic Lazarus Zamenhof (1859-1917),the inventor of Esperanto, which Eric claims to be able to speak. After one final café stop of the trip, we returned to the hotel by walking along the sea front where many of the city's residents were enjoying the sun, the sand and the sea and some were using special colourful kites to wind surf. 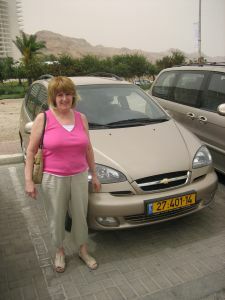 At the hotel, Eric said a sad farewell to Medad before we four drove to Ben Gurion airport and handed back our rented car – we had done almost 1,000 km (625 miles). In security terms, leaving the country seemed to be more complicated than entering it with detailed questions about the nature and purpose of our visit. The flight back to London was uneventful, except that we took off two hours late due to engine problems and the flying time was half an hour longer than the flight out. On this wonderful trip to Israel, we saw so many places and met so many people and Roger took so many notes that Eric, alluding to that famous line in the movie "Jaws", at one point quipped "We're going to need a bigger notebook". Although Roger took even more notes than usual on this particular holiday, he took rather fewer photographs (around 180) because we were meeting people as much as seeing places. More so than any other holiday that Roger and Vee have been on, religion was an influencing factor and, even though we were only in the country for eight days, we managed to experience the restrictions of no less than three sabbats. So, how can one summarize Israel? Clearly, it is a Middle Eastern country. It is located on the Eastern corner of the Mediterranean and it has the terrain and the climate of a country in that region and some of the foods. However, in many respects, it is much more like a European country: it has a free media and a functioning democracy and visitors can drink the water, eat street food and use credit cards everywhere. Yet there are also elements of America here: the USA provides massive political and military support, many people speak English with an American accent, and even the food portions in restaurants have now become American-sized. However, geographical comparisons alone cannot explain Israeli society. It is a uniquely Jewish nation: there is a right of return for all Jews in the diaspora, religion shapes everything from what is open on shabbat to what you can eat on Passover, and the proportional representation system of election often gives disproportionate power to small religious political parties. Finally, in many respects, it is a military society: every young person – male and female – has to do a period of national service; all adults are in the reserves; war is a constant possibility; security measures are ubiquitous; and much of the country's borders are protected by a wall. There is an Israeli saying: "If force doesn't work, use more force". In short, Israel is a country of great contrasts and contradictions. It has biblical and archaeological sites dating back 4,000 years and yet it is the most modern state in the Middle East by far. Its citizens come from all over the world and consist of the fanatically religious and the totally secular and everything in between. There is desert in the south but green hills in the north with the beautiful Sea of Galilee and the saline Dead Sea in between. It has a city (Jerusalem) that is especially holy to three major world religions and a church (the Holy Sepulchre) that is contested by six denominations. There is quite simply no country like it. One has to hope that the Palestinian-Israeli conflict can be resolved soon and, if it is, the basis may well be a version of the Geneva Accord of December 2003 [click here]. Israel has been a great success as a nation state, creating a dynamic economy and a vibrant democracy with a free media. It is not the apartheid state that some of its critics charge. But equally too it does not treat its Jewish and Arab citizens equally and the behaviour towards Arabs in the occupied territories is often shameful. Security for Israel and land for the Palestinians cannot come soon enough. Seeing Israel with Eric had been a very special experience and to him we offer "toda raba" ("Thanks a lot" in Hebrew).